One idea to save space on your balcony or condo or apartment patio is to place your urban garden along the walls surrounding your space. Much like hanging a beautiful painting indoors, a picture frame garden can help define and complement your outdoor room, patio, or balcony and add some beautiful color, texture, and a focal point to your exterior living area. A picture frame garden is an assortment of plantings that are planted within a growing medium behind woven wire mesh. Many different succulent varieties and sedums are good recommendations for a picture frame garden. Sempervivum (hens and chicks) are cold-hardy, drought-tolerant plants and have many different colors, textures, and forms. Some are large, some are small, and all have baby chicks which can later be transplanted. Be sure to select varieties that stay small. Find an old picture frame or buy one at a yard sale. 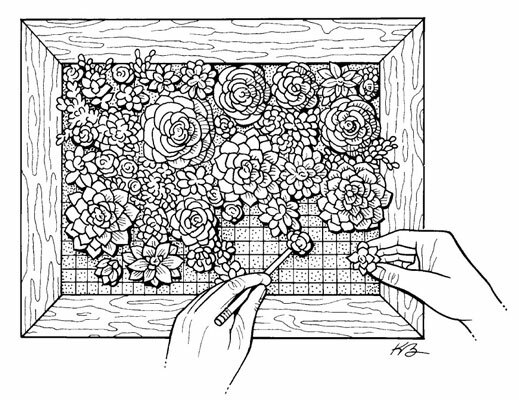 Deepen the frame by constructing a shadow box of 1″ × 3″ material the same size of the frame to contain your growing medium. Set your woven wire mesh (1/2″ hardware cloth is recommended) inside the frame. Back the frame by using 1/4″ plywood sheeting. Once assembled, add your growing medium through the screen, and you are then ready to begin planting small succulents along the wire mesh surface. Plant closely and keep your picture frame garden flat. Leave your frame in a cool space away from direct sunlight. Succulents do not need excessive watering, so lightly water about once a week. Your succulent plantings should be securely rooted in place in about six to eight weeks’ time. In time, your plantings will establish in your picture frame garden. Then you will certainly be eager to raise your picture frame vertically and secure it to an exterior wall. Before raising your frame, drill small holes along the top of the shadow box (behind the frame) for continued watering care.